Drizzle raincoat is an essential outfit for every dog in rainy, windy or muddy conditions. The Drizzle coat is also excellent in cooler temperatures due to the warming foil patterning in its lining. The aluminium foil print reflects the dog’s own body heat, thus stimulating blood circulation and warming the dog efficiently. Thanks to its muscle-warming properties, Drizzle is also ideal for dogs engaged in active sports for warming up and maintaining their well-being before and after performance. 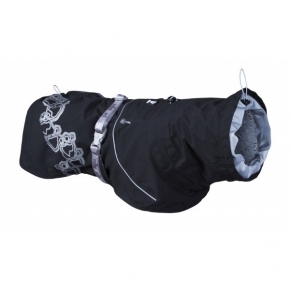 Drizzle is made of an elastic, silent and breathable fabric with a weatherproof Houndtex layer.